When a leak is traced back to a small sub-section of SIS, it sparks off security checks, tensions and suspicions - the sort of atmosphere where mistakes could be made. This novel opens up the lonely, isolated, neurotic world of the Secret Service. Scobie, a police officer in a West African colony, is a good and honest man. But when he falls in love, he is forced into a betrayal of everything that he has ever believed in, and his struggle to maintain the happiness of two women destroys him. Aboard the Orient Express as it heads across Europe towards Constantinople, a relationship develops between Carleton Myatt and Coral Musker, a naive English chorus girl. Around them a web of espionage, murder and lies twist in this spy thriller. Alden Pyle, an idealistic young American, is sent to Vietnam to promote democracy amidst the intrigue and violence of the French war with the Vietminh, while his friend, Fowler, a cynical foreign correspondent, looks on. Terrible narrator nearly derails Greene novel. 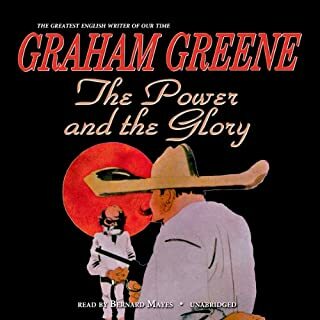 Graham Greene explores corruption and atonement in this penetrating novel set in 1930s Mexico during the era of Communist religious persecutions. As revolutionaries determine to stamp out the evils of the church through violence, the last Roman Catholic priest is on the lam, hunted by a police lieutenant. Despite his own sense of worthlessness—he is a heavy drinker and has fathered an illegitimate child—he is determined to continue to function as a priest until captured. Trusted by no one, trusting nobody, the Confidential Agent is sent to England. But before his mission has barely begun, he comes face to face with an agent from the other side. As the car he is driving is run down in the fog, a thought strikes him: "It isn't probable - not in England, but it seems to be true, nonetheless - they're going to kill me." Three men meet on a ship bound for Haiti, where corruption and terror reign. Disillusioned and noncommittal, they are the “comedians” of Greene’s title, hiding from life’s pain and love behind their chosen masks. Originally published in 1938, Graham Greene’s chilling exposé of violence and gang warfare is a masterpiece of psychological realism and often considered Graham Greene’s best novel. It is a fascinating study of evil, sin, and the “appalling strangeness of the mercy of God,” a classic of its kind. Jack London lived for a time within the grim and grimy world of the East End of London, where half a million people scraped together hardly enough on which to survive. Even if they were able to work, they were paid only enough to allow them a pitiful existence. He grew to know and empathise with these forgotten (or ignored) people as he spoke with them and tasted the workhouse, life on the streets, and the food, which was cheap, barely nutritious, and foul. Over the course of his seemingly irreproachable life, Magnus Pym has been all things to all people: a devoted family man, a trusted colleague, a loyal friend - and the perfect spy. But in the wake of his estranged father's death, Magnus vanishes, and the British Secret Service is up in arms. Is it grief, or is the reason for his disappearance more sinister? And who is the mysterious man with the sad moustache who also seems to be looking for Magnus? In A Perfect Spy, John le Carré has crafted one of his crowning masterpieces. "Glasnost" is on everyone's lips, but the rules of the game haven’t changed for either side. When a beautiful Russian woman foists off a manuscript on an unwitting bystander at the Moscow Book Fair, it's a miracle that she flies under the Soviets' radar. Or does she? The woman's source (codename: Bluebird) will trust only Barley Blair, a whiskey-soaked gentleman publisher with a poet's heart. From his years serving in British Intelligence during the Cold War, to a career as a writer that took him from war-torn Cambodia to Beirut on the cusp of the 1982 Israeli invasion to Russia before and after the collapse of the Berlin Wall, John le Carré has always written from the heart of modern times. In this, his first memoir, le Carré is as funny as he is incisive, reading into the events he witnesses the same moral ambiguity with which he imbues his novels. The British Embassy in Bonn is up in arms. Her Majesty's financially troubled government is seeking admission to Europe's Common Market just as anti-British factions are rising to power in Germany. Rioters are demanding reunification, and the last thing the Crown can afford is a scandal. Then Leo Harting - an embassy nobody - goes missing with a case full of confidential files. London sends Alan Turner to control the damage, but he soon realizes that neither side really wants Leo found alive. Then follow some very real events, such as undercover work and even murder attempts, all backed up by phantom chains of information and invented covert agencies. 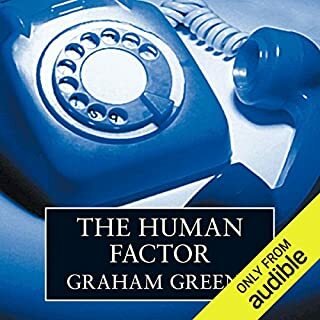 An often light-hearted but massively important complete and unabridged audiobook, which makes many comments on present-day life despite being published over 50 years ago. The book was also made into a hit film starring Carol Reed and Alec Guinness in 1959, and has recently (2007) been the subject of a play adaptation staged in Guildford to a enthusiastic public reception. Lets start with this, if you like classic mystery novels of the "Maltese Falcon" genre then this is going to be a great pick for you. The writing is solid and the plot is quirky enough to keep the interest of the reader, the performance is great and for the genre it is going to be a great experience. The ending, like all British spy novels wraps up in a very tidy package and the whole thing is very wholesome. If you like to dip your toe into the genre every now and then I would say "add to cart" and take a trip to Cuba pre-revolution. Would you consider the audio edition of Our Man in Havana to be better than the print version? What other book might you compare Our Man in Havana to and why? The script of Dr. Strangelove: they're both brilliant satire. What three words best describe Jeremy Northam’s voice? Published four years before the Cuban Missile Crisis, this is a brilliant, very funny cloak-and-dagger about a vacuum cleaner salesman enlisted into British intelligence. The so-called agent reports on unidentified military emplacements that, coincidentally, look a lot like vacuum cleaners. What's real, what's not, and what becomes real are in the mix of this great send-up. Jeremy Northam is a superb reader. 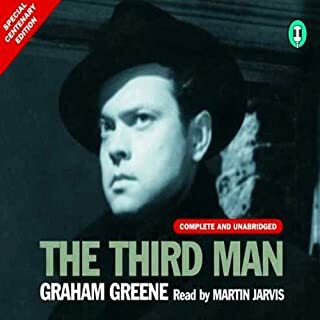 The producers, however, got carried away with their own importance and tried to gussy this up with a repetitive snippet of carnival music that works against Graham Greene's straight-faced telling. Even so, it's terrific and well-worth listening to. Let's hope the producers don't come close to wrecking too many other audio productions. Aaarrgh! I wish I had listened to the reviewer who said the music made listening to this book intolerable. I thought if was worth a shot because I liked the sample of Jeremy Northam's reading so much, but it was a complete waste of a hard-earned credit. It is the same wretched piece of music every single time, it plays ever five minutes, and it's louder than the reading (like commercials during TV shows). Someone should lose their job over this because it would have been so enjoyable otherwise. I found myself chuckling whilst I listened to this beautifully written and recorded book. Greene draws us into the serpentine world of the secret agent and allows us to simultaneously join him in smiling even laughing aloud at the traps the narcissistic members of the professional spy brigade weave for themselves. And through it all the hero and his delightfully artful daughter manage to dodge the bullets and emerge with innocence largely intact. All set against the backdrop of pre-revolution Cuba. I too wish I had listened to the prior review about the music ruining the listening experience. I only listened to about an hour and I can't listen anymore. Jeremy Northam is great, but dear lord. the LOUD music that plays incessantly is enough to make you scream. Like the prior reviewer stated, the music is louder than the narration like commercials on TV. Obnoxious. I've deleted the book from my iPod. I can't endure it. Whoever edited the audio productions must be a big fan of shopping center music. A VERY LOUD Latin rhythm or British band music interrupts the narration every five minutes (or so it seems) at the end of every chapter and between sections within chapters. It was like being tapped in an elevator for 7 plus hours, which very nearly ruined the book for me. "Our Man in Havana" is one of Greene's lightest works, an absurd comic plot but with serious (and prescient) political insights. The reader is adequate. The story itself is well worth the time if you can live with the frequent musical interruptions. What did you love best about Our Man in Havana? I wasn't expecting the chuckles. This is really a preposterous story, one which pokes fun at the Cold War intelligence gathering establishment. While not per se satire, at least in my opinion, the humour is very droll; tongue-in-cheek. No one ever expected this to be that kind of page turner. It's a great story set in the days before Castro, when so many players had "interests" in Cuba. But you get a real sense of the era and what it must have been like back in the day. What about Jeremy Northam?? ?s performance did you like? No "extreme reactions," but a very satisfying read. I was surprised at how much fun Greene had with his characters, and by the same token, his audience. This is not Ian Fleming, James Bond, action thriller. This is not any of the current crop of writers who do this kind of story for the current reader who wants a summer read that can be tossed on the way back from the beach. But this is very entertaining in its own way. Adding My Two-Cents on the Music! Why on earth the loud, disruptive music! I thought those days were over! 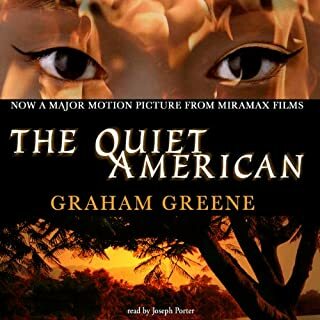 If you’ve listened to books by Graham Greene before, how does this one compare? I enjoyed the other two much more - sans music! What didn’t you like about Jeremy Northam’s performance? So many of your British men have deep, gravely voices that are hard on the ears and not clear. The women are fine and British men without the ancient whiskey voices are great! I love the accents, but not the tobacco-damaged sound. Was Our Man in Havana worth the listening time? It was better as a book. What disappointed you about Our Man in Havana? 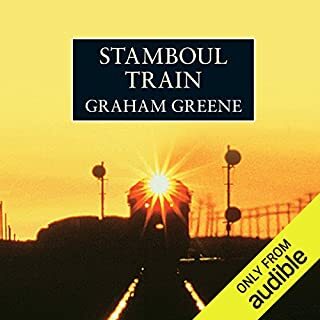 Northam's enjoyable and well-spoken interpretation of this Greene classic is tortured by incessant musical interludes -- not only between chapters but inserted at all the wrong moments by some over-reaching (certainly tone-deaf) producer. Perhaps an intern let run amok? CSA Word Classic should be ashamed of this amateurish tactic that serves only to repeatedly kill the mood and enjoyment of an otherwise first-rate narration. The music relating to Cuba is bad enough, but the trite ditty you hear when the scene changes to Britain is particularly laughable and annoying. Take away his headphones and fire that guy! music is a disaster -- don't buy this! What does Jeremy Northam bring to the story that you wouldn’t experience if you just read the book? I'd like to strangle the guy who put in the disgusting music!!!!!!!! For some reason this excellently read story is punctuated with long musical interludes: Cuban-style music when the action is in Havana and really badly produced, pompous music when it switches to the UK. The narrator, simply states the change of location anyway so it's also unnecessary for understanding the plot. I'm afraid it adds nothing but is a little annoying. Great book - shame about the cheesy music! Book was spoiled for me by the awful music used throughout! Very unnecessary! Well read though and a fab story! Great story by the wonderful Graham Greene; funny and cynical. Including that terrible music throughout was an awful idea that spoils it quite a bit. what idiot thought they could "improve" a classic book by mixing in long bits of cheap music to "set the scene" every few minutes. they must think their readers are stupid. what next? a "teaser" before each chapter? how about a commentator? celebrity endorsement? adverts? did Greene sell his book with a free record attached? it's a book. b. o. o. k. book. I enjoyed this immensely. It is the often hilarious story of cold war espionage in pre-revolutionary Cuba. Jeremy Northam's reading is excellent with superb characterisations - even of the female characters. the excerpts of 'theme music' between chapters - Samba music for Cuba, Brass band for English scenes, fast music at the end of an exciting chapter - were rather irritating though. If you could sum up Our Man in Havana in three words, what would they be? I'm a sucker for intelligent espionage fiction. How could I not have read Graham Greene until now? His subtle and understated writing is perfect for this setting. The story is both dark and amusing, and cruelly takes the mickey out of governments and civil servants. When we were in Cuba I felt languid and relaxed, in Britain chilled and grey. An utterly engrossing listen. Which character – as performed by Jeremy Northam – was your favourite? The main protagonist has the perfect name: Wormold, and he's weak and pliable and ambiguous. But the character with delicious depth and subtlety is Captain Segura, the corrupt and evil strongman who has his own morality and ethics. An audiobook has to be an absolute masterpiece to keep me from all other brain activity from start to finish. Our Man in Havana doesn't quite reach those dizzy heights. But it's a rollicking good listen and the perfect length. I definitely rearranged my activities so I could get back to listening. Highly recommended. My first Graham Greene, I'm ashamed to admit. 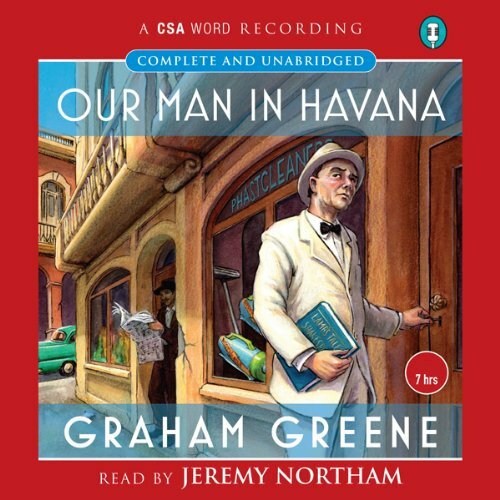 I chose "Our Man in Havana" over other Greene novels because the narration (by Jeremy Northam) was highly rated, and for good reason. The narration and production was just my cuppa tea - completely engrossing story-telling with little snatches of Cuban music between scenes. There were a handful of convenient plot coincidences but they didn't spoil my utter enjoyment of this engrossing audiobook experience. Excellent… Except for the music! 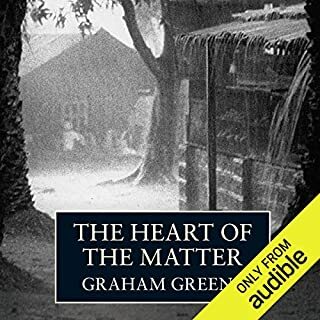 One of Graham Greene's really first class stories, very well read by Jeremy Northam. The whole book was extremely enjoyable, only marred by the completely unnecessary and overlong musical insertions. Really enjoyed this. Like another reviewer, I could have done without the musical interludes to tell us when we were in Cuba and when we were in London, but the rest was great. just an amusing tale of little substance. just an amusing tale of little substance.at least to my un cultured ears you see.